James Fred Hardy (born April 24, 1923) is a former American football quarterback. He was born in Los Angeles. Hardy attended and played high school football at Fairfax High School in Los Angeles. Hardy played college football at the University of Southern California. He was voted most valuable player of the 1945 Rose Bowl game, won by USC 25-0 over Tennessee. 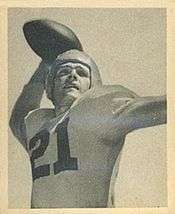 Hardy was drafted in the first round (eighth overall) of the 1945 NFL Draft by the Washington Redskins. He played in the National Football League between 1946 and 1952. He made the Pro Bowl in 1950. Hardy is perhaps most famous for throwing an NFL-record eight interceptions in a single game, as well as for the worst touchdown pass-interception differential in a single game (-8), in a 45-7 loss to the Philadelphia Eagles on September 24, 1950. He later served as the general manager of the Los Angeles Memorial Coliseum. ↑ "NFL Single Game Passes Intercepted Leaders". pro-football-reference.com. Sports Reference LLC. Retrieved December 4, 2016.